Easter is a one of the most anticipated Christian festival after Christmas;and it’s unimaginable without Easter eggs . It’s believed that on Easter , the Easter Bunny takes the role of judging whether the kids have been good or bad and bring sweets, colored eggs, gifts and more to their houses. Kids of all ages and even grown ups love to go hunting for Easter Eggs to find a few surprises for themselves. 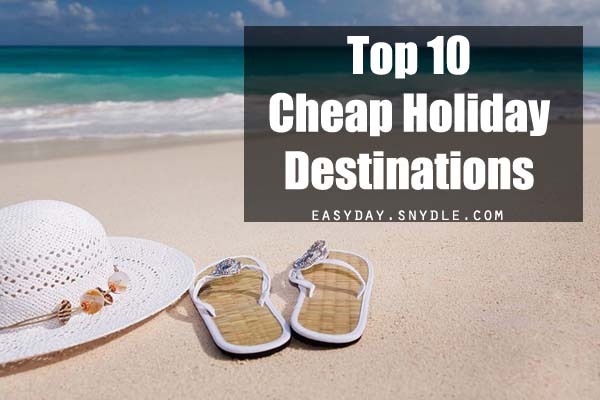 It’s one of the many things people wait for all year and many even go Easter egg hunting with family and friends. There are so many ways by which you can make some interesting and unique Easter eggs for this year’s Easter. 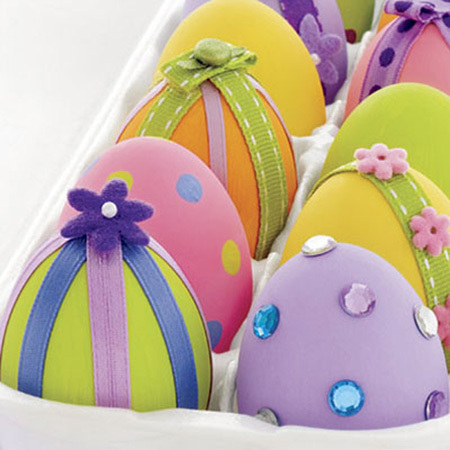 Easter eggs can be used as a decoration for your house of Easter. 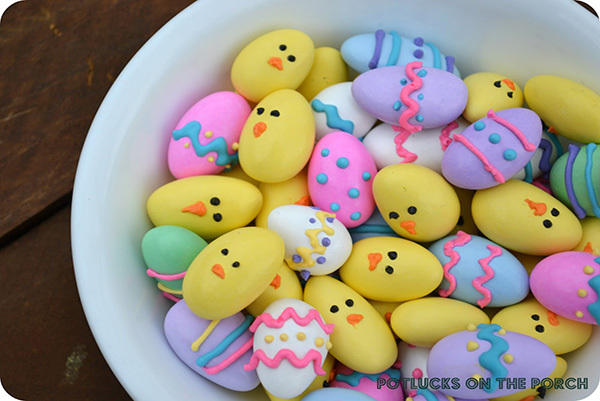 The eggs used for decoration includes plastic Easter eggs as well as real hard boiled ones . usually the eggs are dyed with natural coloring or food coloring as well as paints. But we thought for this year’s Easter you can try a few unique and new designs. We have a few attractive designs to show . Take a look at these designs to find out what what design should you choose this year. Easter eggs are really easy to make and everyone can do them. It’s a great idea to include your kids with Easter crafts and see them enjoy making their own Easter eggs. These cute little Easter egg design are perfect for serving or gifting. These are actually made with Jordan Almonds which come in Egg shape. These make great sacks on Easter and can be served at parties too. Decorate them with food coloring and add some cute details . Button and Laces make for a great combination . 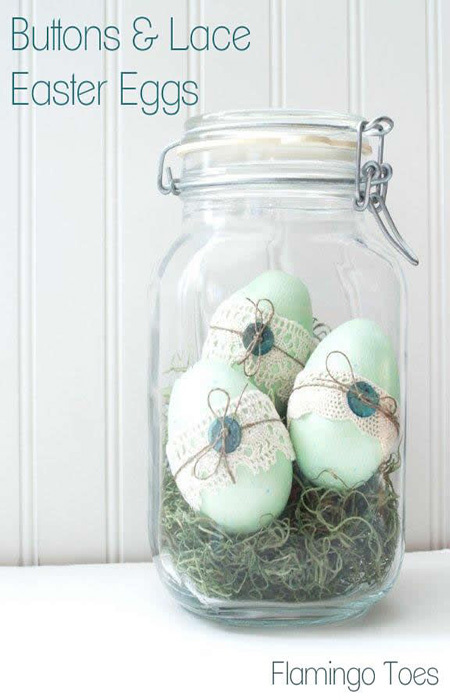 To make these cute and unique button and lace inspired Easter egg take a pretty lace strip and wrap it around the egg . You may use a colored egg or a white egg too. For a white egg use a colored lace. 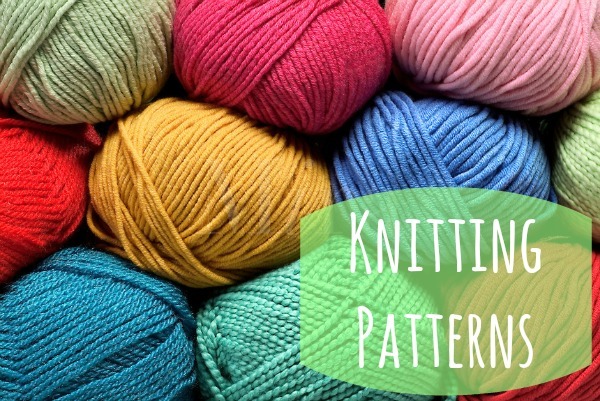 Now take a button in the similar color of the egg and use a bit of string to wrap it over the lace. 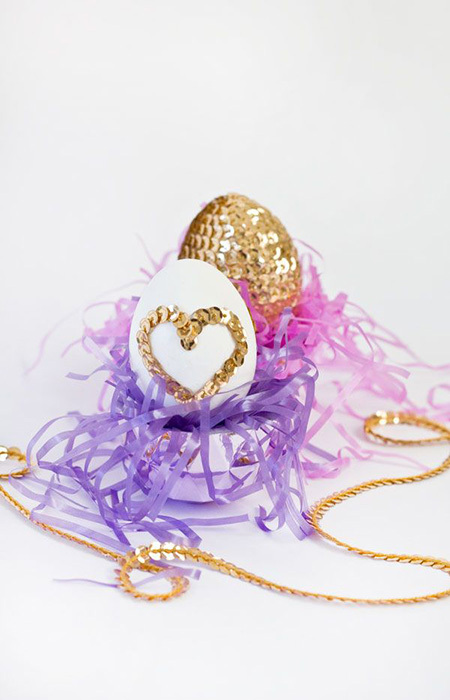 If Gold is what you Love then making a golden leaf Easter egg is a great idea . 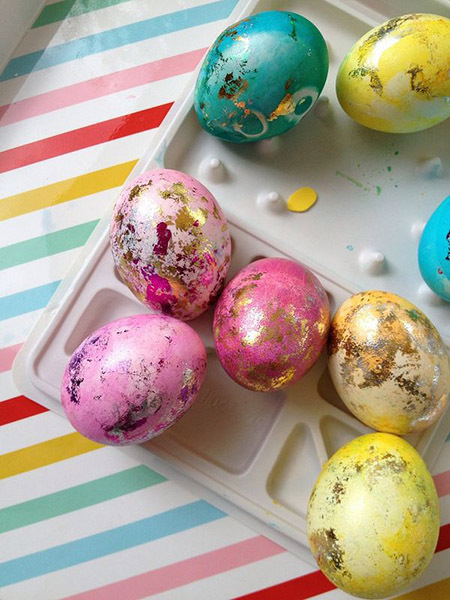 These sparkly eggs will surely be loved and are very easy to create. All you need is some hard boiled eggs and a few sheets of golden foil. 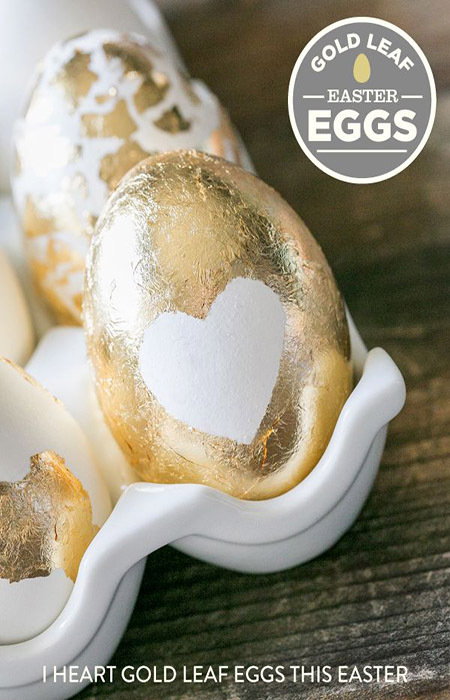 Use a bit of glue to make the golden designs.You can cut the golden foil with a scissor in a heart shape and wrap it around the egg using craft glue. Kids love colors and these colorful Easter eggs are a perfect way to get that smile on their faces. If you are looking for Easter crafts with eggs these are also a great way to engage the little ones with craft. 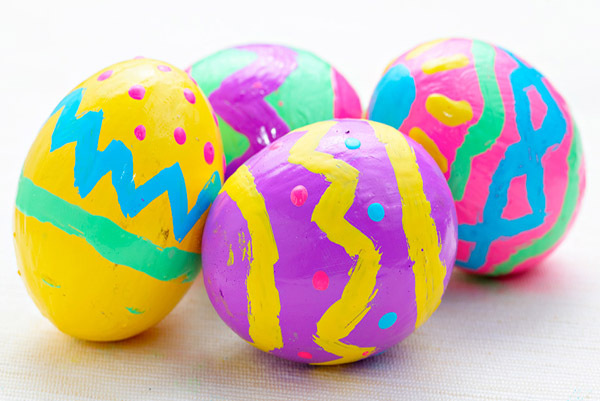 It’s best to use plastic Easter eggs and let them fill them with goodies and use various attractive colors to paint. If you feel that only perfection can make a thing look beautiful then take a look at this simple and easy Easter egg. The eggs are hard boiled eggs which are painted with food coloring pens. The colors are food safe and will not be harmful for your child. Let your child make the designs as they like, it does not need to be perfect. If you have colored Easter eggs at and ask your kids to decorate them with rhinestones, buttons, bows as well as ribbons. Here we see contrasting decorations like flowers, laces, crystals etc are used to decorate the Easter eggs. If the usual designs are not for you and you are looking out for some special Easter egg decorations then check out the ones we have chosen here. 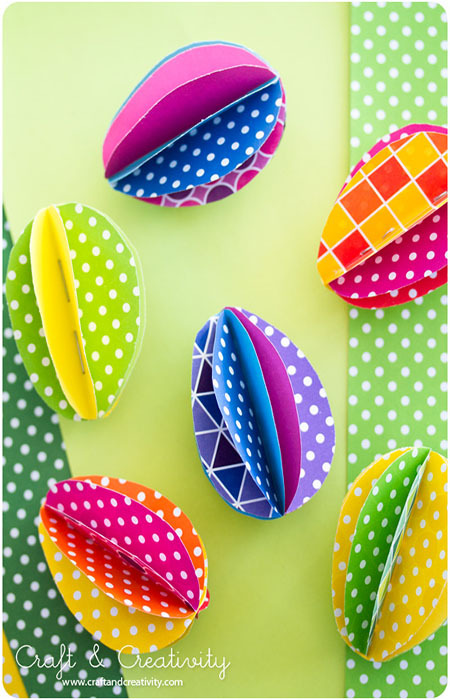 These Colorful paper folded Easter eggs are a unique way to create some eye catching Easter eggs. These are really easy to make. All you need is some pieces of double sided colorful papers and a stapler. Use the sheets which have different shades and different designs on each side to make it look colorful. cut all of the sheets(maybe three/four) in uniform egg shapes and then place them one after another and use a stapler in the middle. Then fold each side and each layer to make the Easter egg. If you are looking for Easter Egg designs that will be appreciated by everyone then take a look at this one here. 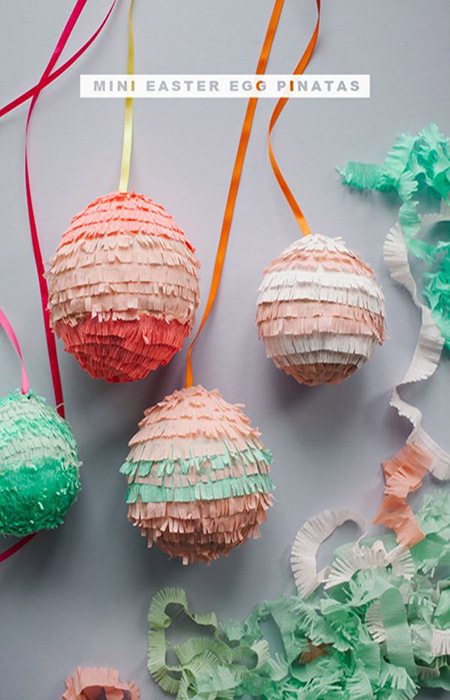 It’s a cute little pinata design which will be a great change from the traditional designs. Use a balloon and cover it wit paper layers(two) dipped in Flour and water mixture . Then dry the layer and deflate the balloon. Use crepe ribbons and make fringes and apply them like sown here. These moss covered Easter eggs are unique and looks so close to nature. Spring is here and what better way to celebrate Spring than these Moss covered Easter eggs. For this you will need some artificial moss, twine, glue and buttons. 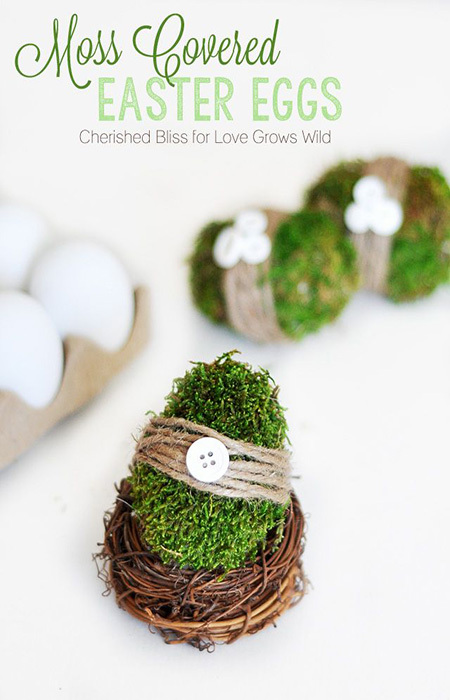 Using glue press the torn moss onto the egg and then use twine and button to further decorate. Make some attractive Glow in the dark Easter egg. 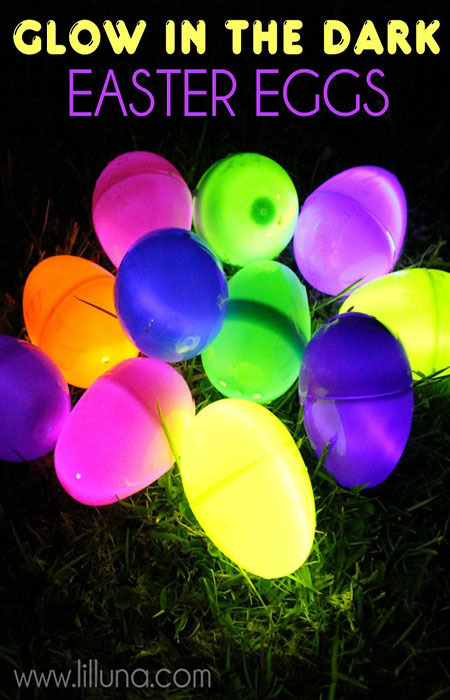 Use plastic Easter eggs and buy some glow in the dark sticks from the dollar stores. Insert some of the glow sticks along with some candy and goodies and leave them for your kids to find. How about some 24 Carat Real gold for Easter? Surprised?? These gold painted Easter eggs with embossed design looks attractive. 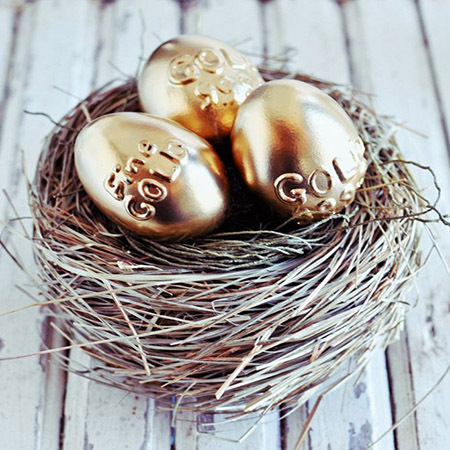 These golden bullion Easter eggs are easy to make and look attractive. To make these use a clean egg shell or buy a pack of plastic ones. Then use three dimensional paint to emboss the designs and then coat the egg with golden paint. There’s a saying that ‘She who leaves a trail of Glitter is never Forgotten’; and if you are such a lady who loves Glitter then add a bit of sparkle to your Easter eggs too. 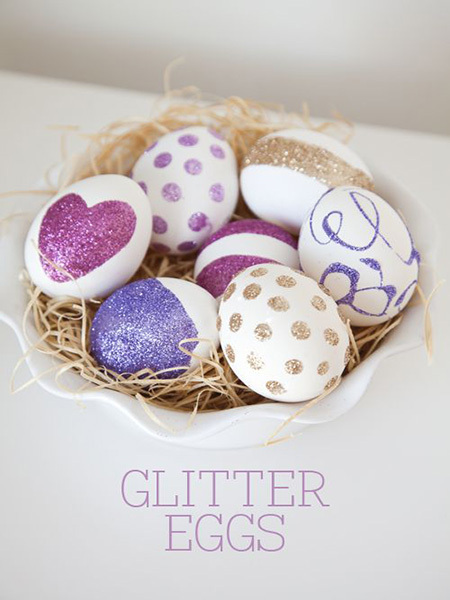 Use glitter paints to make beautiful motifs on your eggs and leave a trail of Glitter behind. If cartoons are what intrigue your senses then try these fun and creative cartoon inspired Easter eggs. 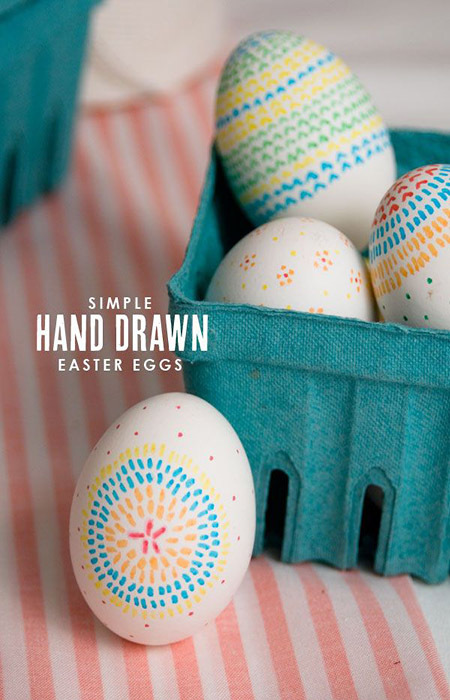 use your paintbrushes and paint to decorate your eggs in any design you want. Here we see Mario, Pokemon, Iron man and more. If you love Sequins and adore golden sequins then here’s an Easter egg design you will love. Use glue to stick the sequins on the eggs and cover every bit of white with it.It will look like a pretty gold disco ball . Love pastel hued sprinkles? 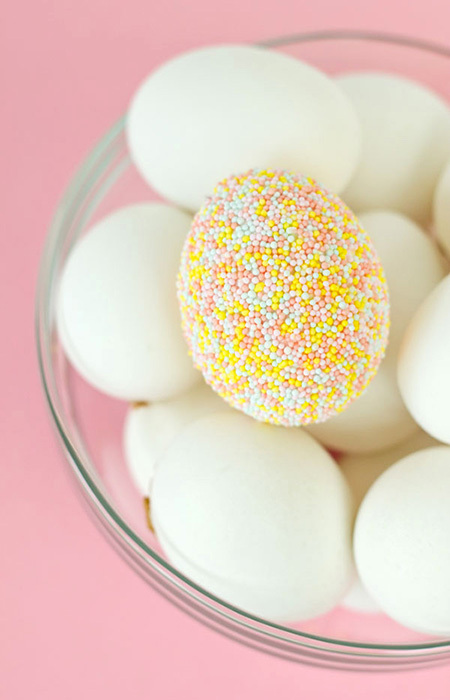 then this Easter egg craft with sprinkles will be ideal for you . Use a bit of tacky glue on the egg and dip it in the sprinkles. Then cover the missed areas with more sprinkles so that the whole egg is covered in it. Use pastel shaded sprinkles with multiple colors. These elegant looking Easter eggs are very easy to make . 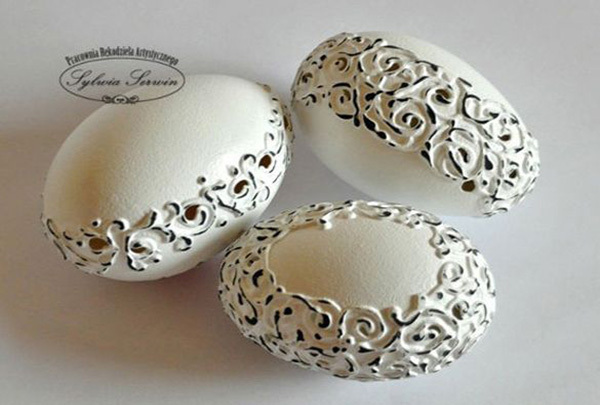 All you need for this craft is empty egg shells, 3d craft marker, drill machine, sandpaper and white color Use pencil to create the designs you want and allot special spots where the drill will be done. Then use your 3d black marker to make the designs and paint them white . After the paint is dry use a bit of sandpaper to scratch some of the designs so that it looks similar to this one. 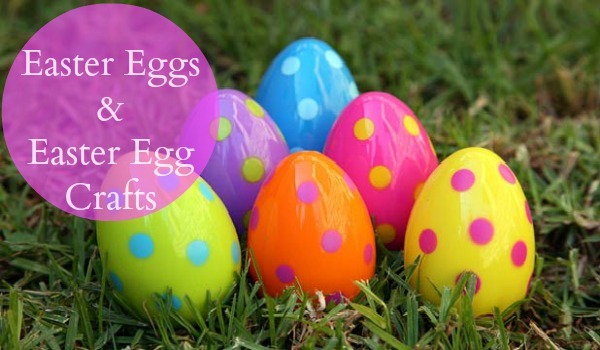 Easter Eggs can be used to make pretty Easter Crafts and here are a few for you to try this year . 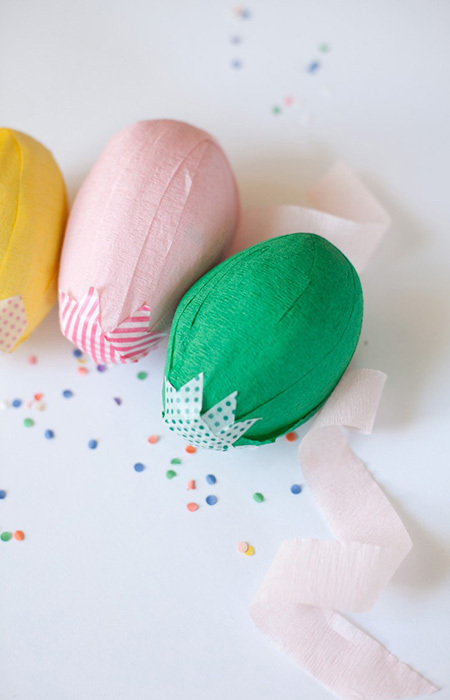 Washi tape has been one of the most versatile and colorful craft items and using it you can make really beautiful Easter eggs. Use many different type, colors and patterns of Washi tape to decorate lots of plastic Easter craft eggs. 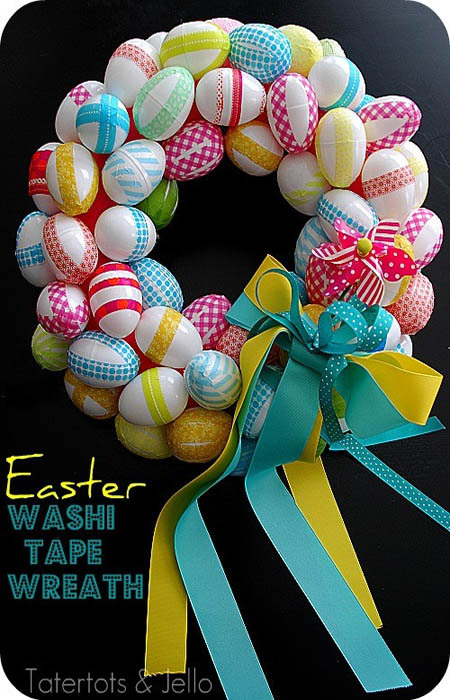 Then use the eggs to make a wreath and attach some colorful laces to go with it. If you’d love to surprise your children even more then there’s an easy way to make a cute little surprise egg. To make it you will need plastic eggs, lots of small surprise gifts, large surprise gift to put inside the egg, crepe laces and glue. Fill in the egg with the large surprise gift and then use multiple layers of crepe lace to hide small surprise gifts in each layer. Seal off the top with some cute design and you are done. If you love Marble nail art or the marble look then creating a DIY marble nail art Easter egg will be a great idea. All you need for this project are some unused or unwanted cheap nail paints, some real/artificial Easter eggs and a glass of water. 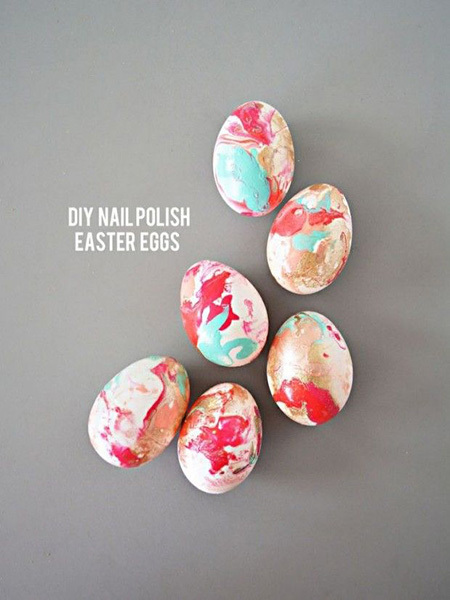 Add drops of all the shades f nail paint you want to use one by one in the water and then dip the egg into it. Take the egg out and enjoy your Marbled Easter egg recipe. 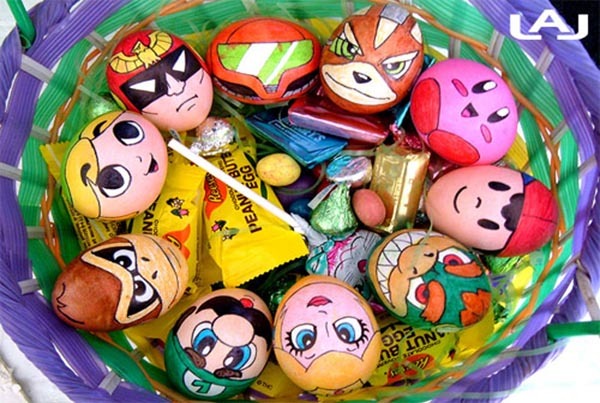 These cute and colorful Easter eggs may be just what you had wished for all this time. To make these dye the eggs in color and wait for them to get dry. Then apply a bit of glue on the eggs in separated and random order. Use a glittery gift wrapping paper to cover the egg and remove the layer to keep some parts for the glittery paper on the egg. So these were some of the designs we loved ..Do let us know the ones you loved and have used. Have a happy and fun Easter.